Old shirt? New shirt? What’s the difference? 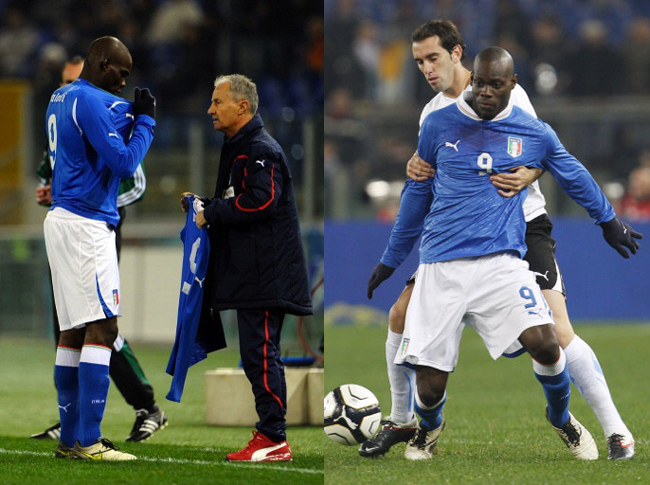 “Why always me?” – well, Mario, maybe it’s because you’re a bit of an eejit! In Italy’s 1-0 defeat at the hands of Uruguay, the City star appeared for the second half of the game wearing the Azzurri’s old shirt, rather than the swanky brand new one which had been unveiled in the run-up to this game, and which he had worn for the first-half. Only after a stoppage, when the striker was booked for a foul on Diego Perez, were the Italian staff able to get the striker to change his top. Is there no end to the Madness of King Mario? Amazing. Truly…amazing. I love this guy! Luckily they had a spare shirt. Otherwise Super Mario would have to play the game in his pants and vest. Which means, either he played 45 minutes in that shirt and no one noticed (even though he was the star of the half), or he changed into it at halftime. I think that’s even stranger. Still, crazy as he is (I believe he tried to pick fights with each member of the Uruguayan back four individually in that half), he was unstoppable in that first half, and I’m a Uruguay fan. They just couldn’t contain him. @PS Good spot – loads of reports said he was a second-half sub! Changed now. How can anyone not like this kid ?? He must have brought the shirt with him, no? I mean, usually the equipment manager stocks the changing room, unless he made the mistake himself. I hope he got a yellow card for that. Why? No law in the game states that the uniform has to be the exact same replica kit. So long as the colours and number is correct, the referee has no justification to issue a yellow. Unless of course he switched the shirt without the referees permission. Mario wasnt a second half Sub. Mario wore the right shirt in the first Half. in the 15 mins halftime he changed his shirt like everyone else but did the silly ( or genius) mistake and wear the old shirt. the Italian staff noticed the difference during the match and when Balotelli committed a foul and got booked after that he changed the shirt !! lol he’s so funny!! Yawn, by the time he’s in his 30’s people will have tired of his gimmicks and he’ll have to resort to lying down on the centre circle and smearing his own faeces just to still get their attention.